Autumn with you today to share a little CAS inspiration featuring our new Lotus Blossom die. I was in the mood to do something a little different, so I sponged a background panel with a variety of fiery Distress Inks and gave the background a flick of water. I removed the water with a dry cloth. I cut two lotus blossoms, one from gold and one from black and layered them over my inky background. You can see the beautiful shimmer and shadow effect. A simple stamped sentiment and black mat complete the design. 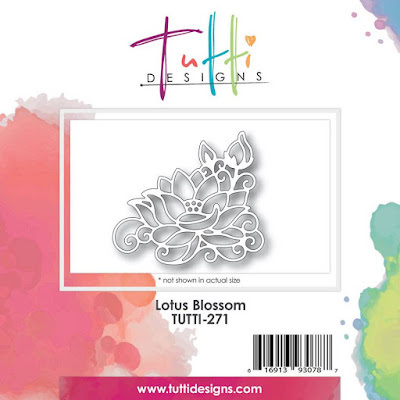 Purchase your Lotus Blossom die today and view our Asian release on the Tutti website HERE. Beautiful creation Autumn! Love that fiery background and your shadowed blossom is just gorgeous! Fabulous CAS creation! Thanks for inspiration! Wow what a gorgeous background color and shadowing the black and gold Lotus Blossom.